In lieu of over-complicating pipe tobacco humidification, most pipe aficionados simply use the pinch test to determine the moisture content. The pinch test involves pinching a small clump of tobacco between the thumb and forefinger: the tobacco should clump together for no more than a few of seconds and then release itself. If the tobacco crackles, it is too dry. If it stays clumped together it is probably too moist. The differences between cigars and pipe tobaccos includes plant varietals, growing techniques, curing/fermentation processes, and most notably construction, production, and storage methods. Consequently, humidification standards for pipe tobaccos are not the same as for cigars: pipe tobaccos do not require the same strict adherence to 70% RH and 70°F like cigars. Pipe tobaccos can be stored between 55% RH up to 75% RH for long term preservation. In addition, they should always be kept away from sunlight and in relatively cool temperatures; like wine and cigars. Ultimately, only your own personal preferences can determine the best humidity levels for your pipe tobacco. Preferred humidity will vary between different cuts and blends because the tobaccos will have different densities and smoking characteristics. Cube, ribbon, plug, and shag cut tobaccos all smoke best at different humidity levels and only the personal preferences of the pipe smoker can determine what moisture content is best. 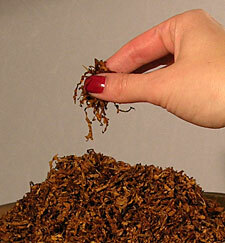 Fortunately, pipe tobaccos can be moistened or dried out with relative ease.